I just don’t think the Bears are going to take a quarterback with the third pick. Through the first two waves of free agency, I saw Pace as someone who was just trying to plug as many holes as he could so that they could pick up some wins and he’d get a chance to keep building the team next offseason. George McCaskey made it clear that he isn’t patient and I think Pace heard that message. Mike Glennon is a reliable player who Pace hopes can be just good enough to get him to next offseason. It’s possible that Pace sees upside in Glennon; sees him as somebody who could potentially be the answer. Realistically, I think Pace is just hoping Glennon can buy him more time. My hunch is that Pace has ID’d his answer and it’s Jimmy Garoppolo. Drafting a quarterback in the first round this year would mean he couldn’t realistically go after Garoppolo next year. Sticking with Glennon and a QB drafted later leaves all options on the table. Even if it’s not Garoppolo, I haven’t gotten any indication that he believes the answer is among the guys available early in this draft. Pace had made comments about valuing decision making (Watson), experience (Trubisky) and elevating their teams and programs (Kizer and Mahomes). Perhaps those were all part of a smoke screen. But I’m not betting on it. I do think the Bears will draft a quarterback at some point but my guess is Pace will view that player in the same light he sees Glennon – someone who could be the answer, but probably isn’t. 5. Marshon Lattimore, CB, Ohio St. The Bears grabbed two lottery tickets in Marcus Cooper and Prince Amukamara, but Lattimore is considered to be a star. The rumor is they were after Jalen Ramsey last year so Lattimore would make sense. The only concern is that he has a history of hamstring injuries. 4. Jamal Adams, S, LSU. There’s a lot to like about Adams, but the positional value doesn’t add up unless he’s an elite safety from Day One. I’m not going to say he won’t be, but his speed was brought into question after the combine and he didn’t show a lot of ball skills in college. 3. Solomon Thomas, Edge, Stanford. Thomas is a slightly bigger, more athletic version of Shaq Lawson, who was a first round pick last year. He’s a terrific athlete, but raw as a pass-rusher. Was inconsistent last year. Could be somebody whose ability is too tantalizing for the Bears to pass up. 2. 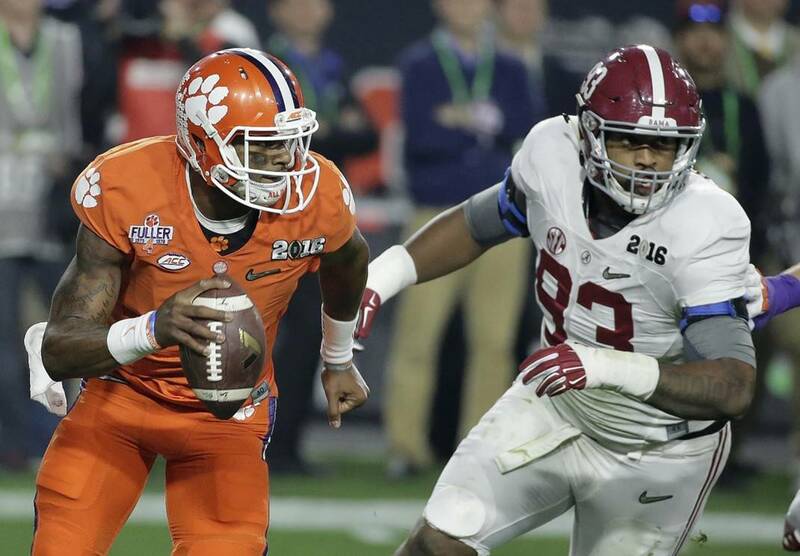 Jonathan Allen, DE, Alabama. Allen is a Day 1 starter as some sort of freak combination of Mitch Unrein and Jonathan Bullard. He’d rotate with Eddie Goldman and Akiem Hicks, playing most passing downs and improving the team’s pass rush. There were some concerns about his shoulders, but the fact that Vic Fangio attended Alabama’s Pro Day and that they’re bringing him in for a visit tells me the Bears probably aren’t too concerned. 1. Myles Garrett, Edge, Texas A&M. Freak pass rusher compared by many to Julius Peppers. Probably won’t be there for the Bears, but the Browns and 49ers just might take quarterbacks or trade to teams who will. Crazier things have happened. Hell, that scenario happened just last year.